Spread squash cubes (and additional vegetables that you are roasting) out on a large baking pan. In small bowl, combine 2 tbsp extra virgin olive oil, syrup, 1 teaspoon vinegar, kosher salt, and 1/2 teaspoon black pepper. Pour mixture over squash and toss to coat evenly. Roast, tossing occasionally (every 10 minutes), until squash (and other vegetables) are very tender and caramelized at edges, about 30 minutes. In a large skillet, warm 2 tbsp extra virgin olive oil over medium heat. Add leeks (or onion), garlic, rosemary and a generous pinch of salt. Cook, stirring occasionally, until leeks (or onions) are very soft and not at all browned, about 15 minutes. Add beans and broth and simmer for 10 minutes. Stir in winter greens and cheese. Simmer until winter greens are cooked down and very tender, about 10 minutes. Stir in squash (and additional roasted vegetables) and cranberries; season with remaining 1 1/2 teaspoons vinegar and 1/2 teaspoon black pepper. Garnish with additional cranberries and sea salt, and serve over a couscous or with a piece of cornbread on the side. I never knew what brussel sprouts looked like growing on the stalk. What a treat to discover that last week’s CSA included them on the stalk…right in time for the big Thanksgiving meal! 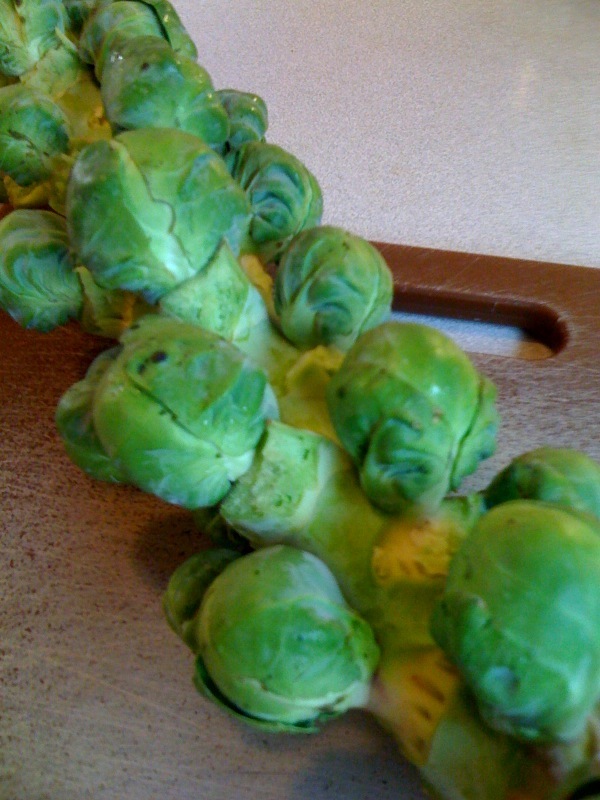 Prepping them for this dish was so simple – just snap them off the stalk, no need to cut the off the ends of each brussel sprout. This is a really easy, simple recipe that can be used with green beans, brussel sprouts, asparagus, or any number of spring or winter green vegetables. In this case, I had green beans and brussel sprouts on hand from my CSA share. The recipe calls for shallots, however this time I didn’t have any so I used finely diced red onion from the farmers’ market. Lightly steam whole brussel sprouts and green beans together in a pressure cooker with about 1 cup of water or according to your pressure cooker’s directions. Cook on high until just comes to pressure. 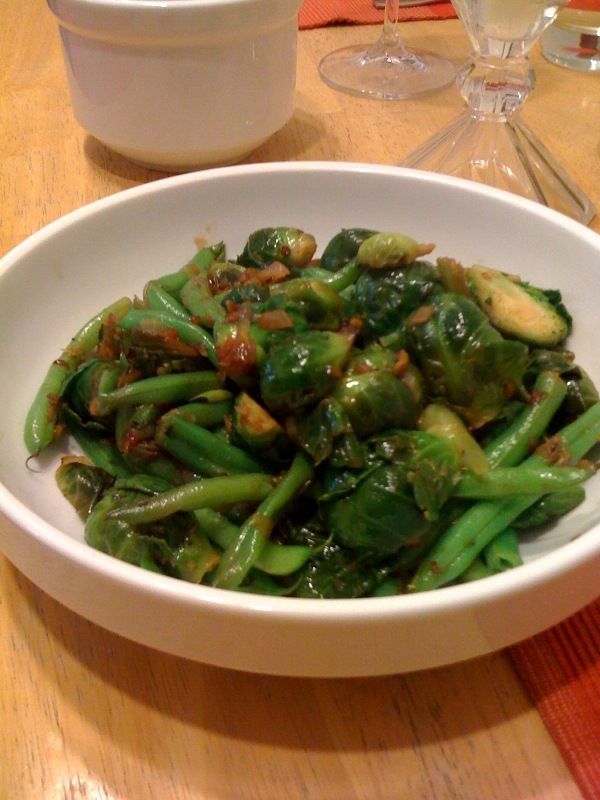 Run partially steamed beans and brussel sprouts under cold water to stop them from cooking. Drain and set aside. Saute shallots or onions and thyme in extra virgin olive oil in large pan over medium-high heat, until slightly browned. 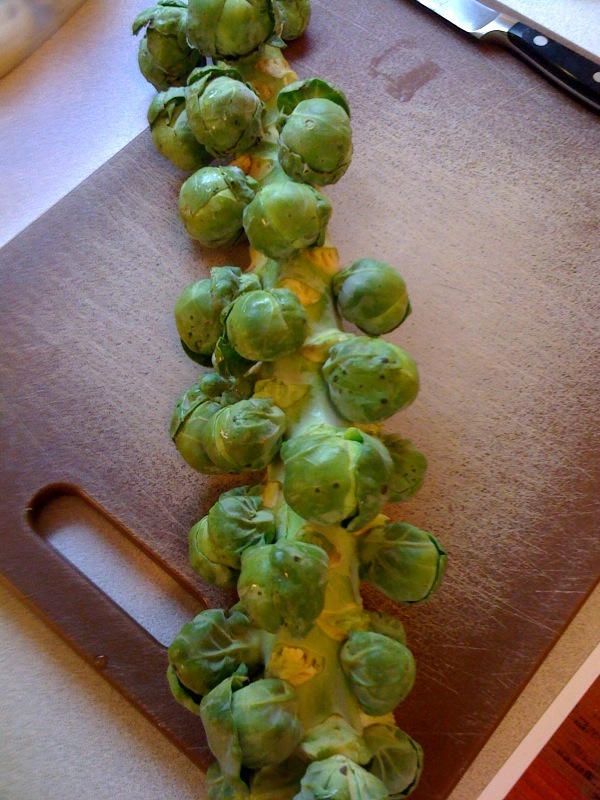 Meanwhile, cut brussel sprouts in half. Add brussel sprout halves and whole green beans to the pan. Saute for about 4 minutes, stirring frequently. Add melted butter. Saute until vegetables begin to brown. Add balsamic vinegar (and lemon juice if your using it). Sautee for one minute, until vegetables are well coated. Remove from heat, stir in lemon rind and salt and pepper to taste.